So I went to the Gay Men’s Chorus of Washington (GMCW) Red & Greene holiday concert last evening. It was the first of four performances of this annual event here in DC, and usually has a delightful mix of serious and light hearted entertainment. Last night was no exception. I was entertained, I laughed, and was even moved at times. 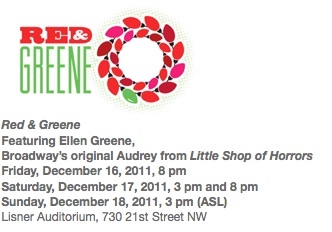 I’m no drama/theater/music critic, so this isn’t a “review” (if you can go, I recommend going! ), but there was one piece last evening which irked me. Here’s what it was, and here’s why. Shortly into the second part of the show, the part that is usually more funny and a bit campy, a group of chorus members performed dressed in black habits — the generic habit one sees when someone wants to “dress up as a nun.” They all had names that were variations of Sister Mary Something — the French accented Sister Mary Antoinette with a large white pompadour; the Latina Sister Mary Juana with … well, you get the picture. The performers were talented and the parodied lyrics of familiar Christmas songs were certainly clever and witty. In Catholic parlance, “religious” can be a noun, and “a religious” is a woman or man who takes certain vows, lives in community, and spends her/his life in prayer and service. Now, even most Catholics would look at last night’s skit and see the humor in it, or at least the intended humor. But I knew in my gut that I didn’t like it. Even my companion — a non-Catholic — at one point leaned over and, with a reference to San Francisco’s famous (or infamous) Sisters of Perpetual Indulgence, said he never understood why dressing up as nuns was funny. And, to be blunt, I don’t either. I found it offensive and sexist. Religious women (interchangeably referred to as sisters or nuns, though there is a difference) seem to be fair game within the LGBT community when it comes to groups or types of people to make fun of. You’d think we’d know better. Actions like this, which challenge us to re-think our received ways of thinking and seeing — especially when it comes to the ways we think of and see others — is what makes me proud of such efforts from within the LGBT community. 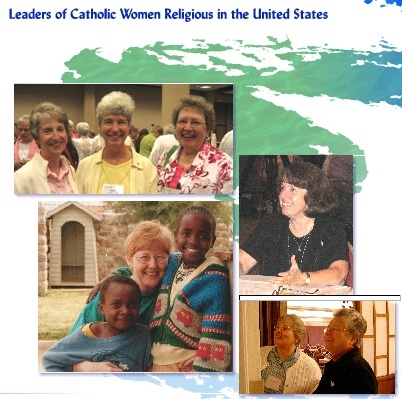 Catholic religious women have historically been the unsung heroines of pastoral ministry in the Church (and, I would say, society). They are the ones who teach and heal and comfort and nurture and care for others each and every day. They typically do so quietly, without much fanfare or recognition. They also are active promoters of Gospel values by seeking social justice, advocating for the poor and the “least among us” by challenging ecclesial, social, and political institutions, often being the voice of those who can’t speak for themselves. Currently, there are over 55,000 women religious in the US in many and varied ministries, doing good and transforming the world. Aren’t they also “worthy of the same respect all Americans deserve”? Let’s stop using these good women as cheap props and easy targets in gay skits, Pride Parades, and drag shows. They deserve better, and we should know better! This entry was posted in Commentaries, Current Events and tagged Gay Men's Chorus of Washington, GMCW, nun, religious women, roman catholic, sisters. Bookmark the permalink. ← “Thy Kingdom Come” …but maybe not just yet?? As a woman religious for more than 50 years, I appreciate your sensitivity. Some gay men have told me that their nuns’ attire is meant to mock the institutional church, the source of their hurt. But this pain was not caused by nuns, who themselves have suffered at times at the hands of Catholic Church hierarchy. Let’s hope that a public discussion about this kind of cross-dressing, that doesn’t make sense, will lead to a respect for all people, even those with whom we disagree. very well said – as gay men we know the power and hurt which parodies and jokes can have. You are so correct that we shouldn’t mock these women whose lives are devoted to the ministry of love, compassion and care.